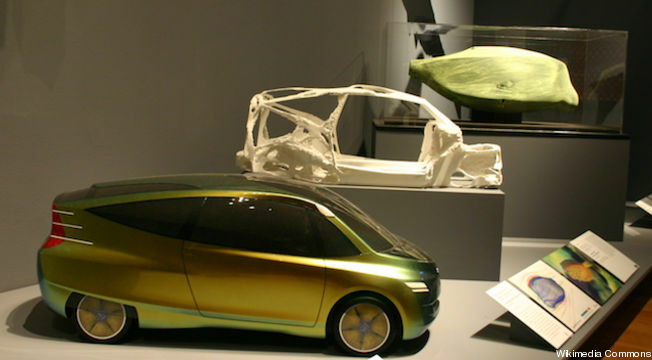 There’s something fishy about the design of futuristic, eco-friendly cars like the Toyota Prius, Mercedes Benz concept Bionic and the Nissan concept EPORO, namely that their designs seem to be inspired by marine animals. In the case of the Bionic, one animal in particular was the model: The humble boxfish. This is the unlikely story of how the little fish came to be seen as a symbol of technological progress and prowess by one of the world’s most prestigious automobile manufacturers. Boxfish can be found in reef habitats from Puerto Rico to Hawaii and, like other tropical fish, they are brilliantly colored—some are sunflower yellow with black polka dots, others have leopard-spotted electric-blue bellies. But boxfish would not win any Caribbean beauty contests. The front two thirds of their bodies are encased in a bony carapace that come in all sorts of shapes—some triangular, others rectangular or even trapezoidal. Ridges jut out over their eyes and bony keels stick outward from their bellies and backs. In other words, it’s the last kind of fish one would expect to be aerodynamically smooth. who here bodybuilds/weightlifts, but drinks like a fish? fish tank check valve PICS.